Place a Do Not Operate Steering Wheel Cover on your machinery to prevent injuries. 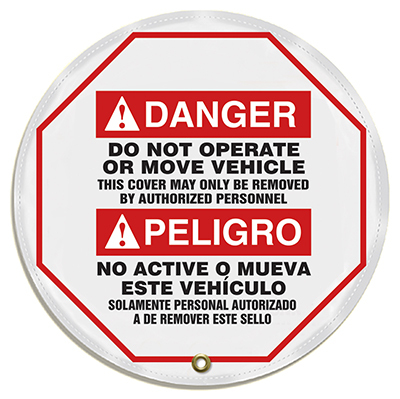 Bilingual Steering Wheel Covers ensure everyone understands. 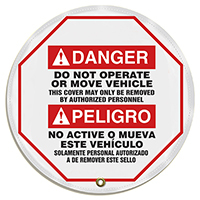 • Reinforced vinyl cover fits over standard steering wheels. • Bright colors are highly visible. 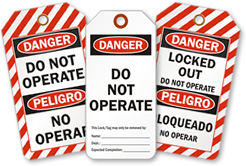 Covers prevent accidents and help remove liability. • 3/8" grommeted hole accommodates a 1 1/2" hasp with padlocks (not included). Perfect for securing the cover to the wheel.